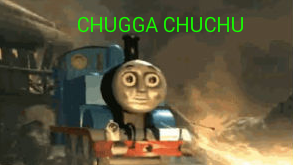 All Aboard the Chuchu Train! A fanclub for the veteran! The master! The rapper! The writer! The friend! THE CHUCHU! u aren't the boss of me. you only just friended me. you have to be on my friend's list for at least 3 days before you can be my boss. Gaston. You just don't understand him. I bet a giant otter would eat a dolphin. Okay so god is almost confirmed and I'm glad supernatural hates furries too. This means I'm Chuchu's favorite president! Well, aside from the Lenny face. BufferAndLoad made a beautiful banner for the club! Lemme on the Chuchu train. Also, the diddly's with Terra? Since when did Chu = Dumbass Hero? That's not a picture of Terra, it's a picture of Chuchu. Who's Terra? Glad I never paid attention to that spell in the game.